USTA Southwest juniors may not be known for their clay-court prowess, as there aren’t exactly an abundance of clay-court facilities scattered throughout the Section on which to train and even fewer events to compete in. 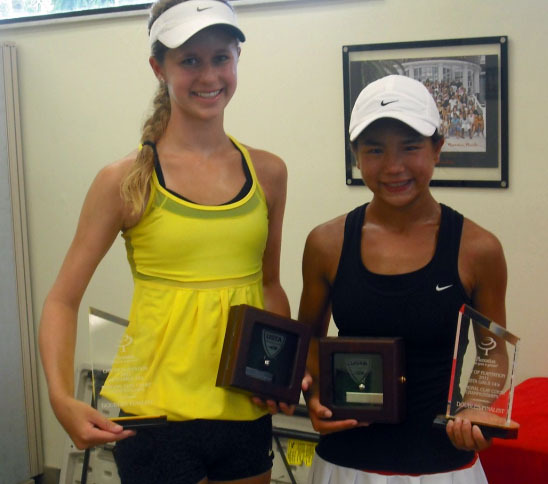 But that didn’t make much of a difference during last week’s USTA National Clay Court Championships, as several Southwest juniors put the Section on firm footing, notching a handful of strong results, including a title, a runner-up and two third-place finishes at events held across the nation from July 17-24. Nathan Ponwith who last year won the gold ball in the Boys’ 12s doubles (and finished second in singles) in North Carolina, aged up this spring. But the 13-year-old has had little trouble adjusting to his first year in 14s competition. Ponwith, the 17th seed, lost in the Round of 32 in singles, but still struck gold at the tournament, partnering with Florida’s Jake Devine in doubles. The duo went on a six-match winning string that took them to the doubles crown, defeating four seeded teams, including the No. 1 and No. 2 seeds in the semifinals and finals, respectively. In the final, Ponwith and Devine outlasted Maryland duo Yancy Dennis and Francis Tiafoe, 3-6, 6-4, 7-5. Maddie Pothoff (Tucson, Ariz.) reached the Round of 16 in singles, but it was her doubles success that was most notable. Pothoff (left, in picture) and partner Emma Higuchi (Los Angeles, Calif.) took out four teams, before falling in the finals to top-seeded Lauren Goodman (Fort Wayne, Ind.) and Emma Stein (Dublin, Ohio), 6-4, 6-1. It was the second runner-up finish in the last three national events for the 13-year-old Pothoff, who, like Ponwith, is having a great first year in the 14s division. Pothoff also finished second at the 2010 Winter National Championships in Phoenix in doubles. 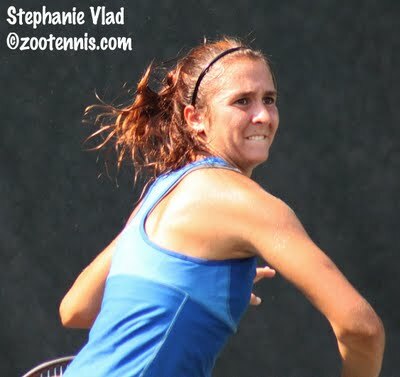 Stephanie Vlad (Scottsdale, Ariz.), the 2011 Southwest Junior Closed winner in Girls’ 18s, came into the Clays tournament as the nine seed, and ripped right through that seeding, reaching the semifinals, pulling one of the biggest upsets of the tournament - downing hometown girl and No. 4 seed Catherine Harrison in the quarterfinals, 6-2, 0-6, 6-3. Vlad continued that sterling play in the semifinals against unseeded Denise Starr, running off the first set 6-3. Vlad came within two points of victory twice in the second set, but dropped the set in a tight tiebreaker. She still looked headed for the finals, up 3-0 and two service breaks in the third set, before she unraveled and dropped six consecutive games to fall 3-6, 7-6, 6-3. Still, Vlad ended up finishing third, her best performance at a National Championship event. It was her second semifinal finish in her last three National Championship tournaments (She made the semifinals at the 2010 Winter National Championships in Phoenix and finished fourth). Tempe’s Delaney Nothaft partnered with Nadia Gizdova of Columbia, Md. and the duo gelled immediately, winning four matches, including three over seeded pairs, before their run was ended by Madeline Meredith (Vestavia, Ala.) and Danielle Vines (Elizabethton, Tenn.) 6-1, 6-4. Nothaft has finished third or better in her last three national championship doubles events (Winter Nationals 2010- runner-up, Spring Championships – third place). 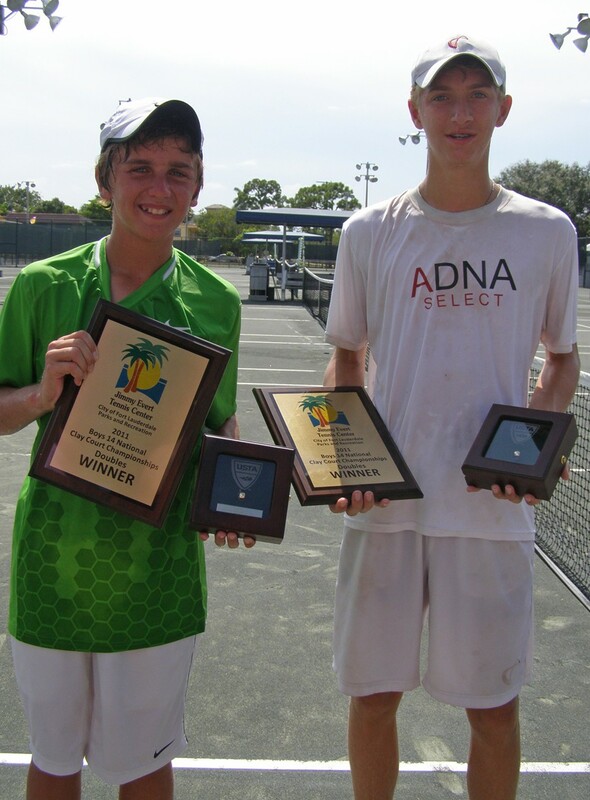 The USTA National Clay Courts Championships are one of four Level 1 national events, the highest age group classification junior tournaments in the nation. All events are played on Har-Tru surfaces. All final-round results from the National Clay Court are below. The USTA National Hard Court Championships start in a couple weeks at various spots across the country.